My partner and I lost our first baby in December 2013, laying helplessly on the hospital bed, looking at the scanning screen and seeing a blank space where our baby should be cuddled up was the single most heart breaking thing either of us have ever experienced. Every day is a struggle thinking of the should of’s and could of’s looking at new parents and mums to be and thinking “that should be me”. 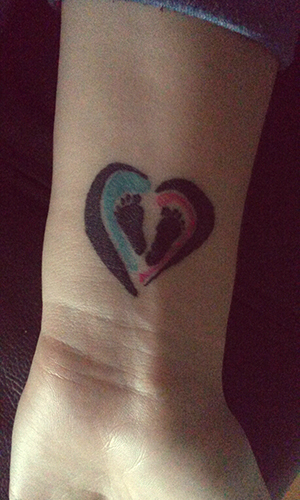 I got my tattoo to symbolise our little pip, and the foot prints s/he left on our hearts, the blue and pink to represent the miscarriage awareness ribbon.